VANCOUVER, BC--(Marketwired - June 06, 2017) - Endeavour Silver Corp. (TSX: EDR) (NYSE: EXK) announces it has acquired 100% interests in two small but prospective mineral property groups, Calicanto and Veta Grande, located in the historic silver mining district of Zacatecas in Zacatecas state, Mexico. For map click here. 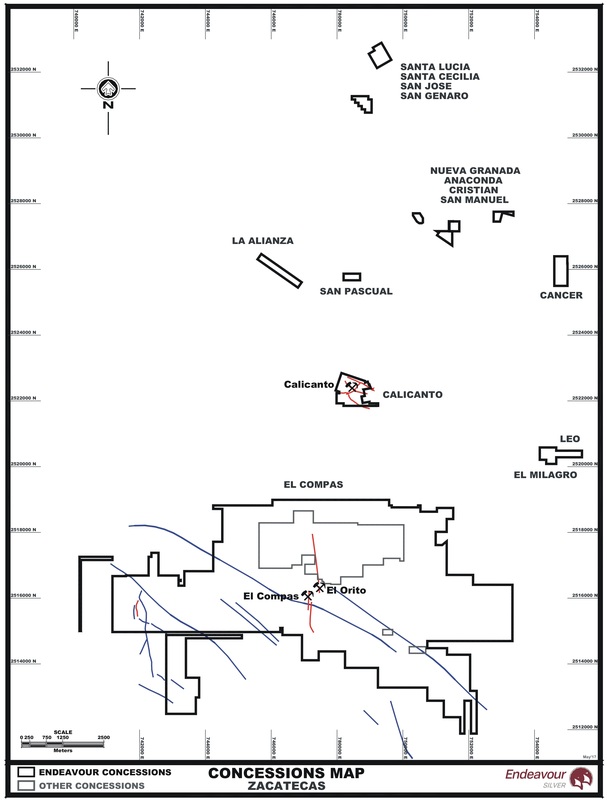 All of the properties host old mines and/or known silver-gold veins that were underexplored by modern methods and are being acquired for their near-term mine exploration and development potential, given their proximity to Endeavour's El Compas Mine and La Plata plant, also located in the Zacatecas district. Bradford Cooke, Endeavour CEO and Director, stated: "We are very happy to add these new properties to our exploration portfolio in Zacatecas. The two transactions confirm there are good opportunities to consolidate a larger mineral land position in Zacatecas, one of the largest historic silver mining districts in Mexico. Drilling is now underway at the Calicanto properties and we expect to permit and drill the Veta Grande properties later this year." Note that all technical data reported in this news release are historical in nature and Endeavour Silver has not independently verified them; therefore, these data should not be relied upon. The Calicanto properties were purchased from Arian Silver Corporation for US$400,000. They cover 75 hectares over five known, silver-gold-lead-zinc veins -- Calicanto, Vicochea, Nevada, Misie and Buenaventura -- within an area of 1.2 by 1.2 kilometres (km). The veins were discovered around 1600, and supported small scale, high-grade production of silver off and on for about 350 years. The mines were historically developed down to approximately 150 metres (m) depth by seven old shallow shafts, and they were closed in the mid 1950s. The upper mine workings are still open but the lower mine workings are now flooded. The Veta Grande properties were purchased from IMPACT Silver Corp. for US$500,000 by issuing 154,321 Endeavour common shares at US$3.24 per share. They cover 152 hectares over six known, silver-gold-lead-zinc veins plus 14 hectares of surface lands covering the dormant Santa Gabriela 200 tpd processing plant and tailings facility. The properties are located in the vicinity of one of the largest veins in the Zacatecas district, the Veta Grande vein, and cover the Nueva Granada splays to the Veta Grande vein and several other subparallel veins. The properties saw historic, small scale, high-grade production as shown by old mine workings and dumps. Access to the old workings is limited and many are now flooded, but historic sampling of dumps and trenches returned values up to 1,070 gpt silver with significant lead and zinc values. The Santa Gabriela processing plant is located adjacent to Endeavour's La Plata plant five km north of the city of Zacatecas and it last operated between 2006 and 2009 as a 200 tpd flotation toll mill. The plant has been dormant since that time and none of the concessions have seen modern exploration. The Nueva Granada concession covers the main San Jose and Armado splay veins off Veta Grande. 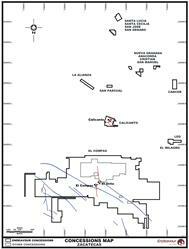 Historic samples from the San Jose vein returned values ranging to a high of 444 gpt Ag over 1.10 m (true width) in channel samples (average 239 gpt Ag over 0.74 m true width) and up to 1,070 gpt Ag in old mine dumps (average 407 gpt Ag). The Armado vein trends 100 m west and runs parallel to the San Jose vein. Historic channel samples collected from the surface exposures of the Armado vein assayed 237 gpt Ag over 1.92 m (true width) and 1,320 gpt Ag over 0.30 m (true width). Sulphide bearing samples from old mine dumps assayed up to 358 gpt Ag. In addition, several other splay veins branch off Armado providing additional exploration targets. The Anaconda Group of concessions cover portions of historic veins that trend parallel to the main Veta Grande vein, many of which have seen historic, small scale production. Historic samples from surface dumps returned 310 gpt Ag, 24.2% Pb and 8% Zn from a high-grade stockpile. The San Pascual concession is the site of the historic San Pascual Mine which last saw small scale production over 20 years ago. The shaft is flooded, however historic sampling of mine dumps adjacent to the shaft returned 875 gpt Ag. Samples from other dumps assayed 525 gpt Ag. The Alianza vein lies on the Alianza concession where historic production was reported to grade 4 gpt Au, 400 gpt Ag, 3% Pb and 2% Zn. The Cancer concession hosts the Providencia vein. A large adit exposes a 1.25 m wide vein with silicified breccias where historic samples from dumps and vein material returned up to 649 gpt Ag. The contiguous Milagro and Leo concessions lies approximately 500 m north of the Cantera Vein system, one of the three principle veins in the Zacatecas silver district; the others being Mala Noche and Veta Grande. Samples from surface exposure of veins and old mine workings returned values averaging 158 gpt Ag. Mr. Dale Mah, B.Sc., P.Geo., is the Qualified Person who reviewed and approved the technical disclosure in this news release. About Endeavour - Endeavour Silver is a mid-tier precious metals mining company that owns three high grade, underground, silver-gold mines in Mexico. Since start-up in 2004, Endeavour has grown its mining operations organically to produce 9.7 million ounces of silver and equivalents in 2016. We find, build and operate quality silver mines in a sustainable way to create real value for all stakeholders. Endeavour Silver's shares trade on the TSX (EDR) and the NYSE (EXK). This news release contains "forward-looking statements" within the meaning of the United States private securities litigation reform act of 1995 and "forward-looking information" within the meaning of applicable Canadian securities legislation. Such forward-looking statements and information herein include but are not limited to statements regarding Endeavour's anticipated performance in 2017 including changes in exploration and mining plans and the timing and results of various activities. The Company does not intend to, and does not assume any obligation to update such forward-looking statements or information, other than as required by applicable law. Forward-looking statements or information involve known and unknown risks, uncertainties and other factors that may cause the actual results, level of activity, performance or achievements of Endeavour and its operations to be materially different from those expressed or implied by such statements. Such factors include, among others, changes in national and local governments, legislation, taxation, controls, regulations and political or economic developments in Canada and Mexico; financial risks due to precious metals prices, operating or technical difficulties in mineral exploration, development and mining activities; risks and hazards of mineral exploration, development and mining; the speculative nature of mineral exploration and development, risks in obtaining necessary licenses and permits, and challenges to the Company's title to properties; as well as those factors described in the section "risk factors" contained in the Company's most recent form 40F/Annual Information Form filed with the S.E.C. and Canadian securities regulatory authorities. Forward-looking statements are based on assumptions management believes to be reasonable, including but not limited to: the continued operation of the Company's mining operations, no material adverse change in the market price of commodities, mining operations will operate and the mining products will be completed in accordance with management's expectations and achieve their stated production outcomes, and such other assumptions and factors as set out herein. Although the Company has attempted to identify important factors that could cause actual results to differ materially from those contained in forward-looking statements or information, there may be other factors that cause results to be materially different from those anticipated, described, estimated, assessed or intended. There can be no assurance that any forward-looking statements or information will prove to be accurate as actual results and future events could differ materially from those anticipated in such statements or information. Accordingly, readers should not place undue reliance on forward-looking statements or information.